I've had a couple different pets. Some of them, well most of them are/were slightly on the odd side. People react to the list with a variety of reactions from enamored to totally disgusted. Fyodor/Stupid was my cutest pet. He was actually a she, but since the name had already been given it was just easier to leave it alone. And he wasn't really mine, I bought the cage and my roommate bought the rabbit because she had less money. However, I became the custodial parent after the first year. Fyodor was trained to be a house rabbit and used a litter box like a cat. When he was just a wee sized bun, the nickname Stupid was given due to his tendency to suddenly freak out and run around my dorm room, inevitably brushing against something, knocking it over, and producing a noise which would add another little scare and make him run more. Despite a tendency to do silly things like that, Stupid was pretty smart for a rabbit and eventually went to live with my parents, who he trained to be his loyal subjects. At the rabbit's insistence (or aim), the litter box was placed in the half-bath which was referred to as the Rabbit's Bathroom ever after. For some reason, like many other pets, he craved that which would kill him - chocolate. He'd follow around anyone and anything with a hint of chocolate smell. He also developed an unnatural and dangerous desire for Peeps. Every morning he would wake my parents up by scratching on their bedroom door until someone got up to let him into the room. At dinner time, he would hop up to the kitchen where everyone was eating and if there wasn't some sort of snack in his bowl (a piece of my pottery that we kept by the doorway), he would grab the bowl by the side with his teeth and knock it against the wall until someone put something edible in it. Occasionally people would come by the house just to visit the rabbit. Such a character. 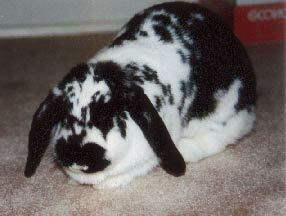 He died a few years ago due to some intestinal difficulties, despite the care of a local vet. Oolong the Rabbit - Don't be afraid of the Japanese, just click on the links with the dates. Talk about photogenic. The House Rabbit Society - If you're curious about house rabbits or want to know where to get one, these are the people to go to. 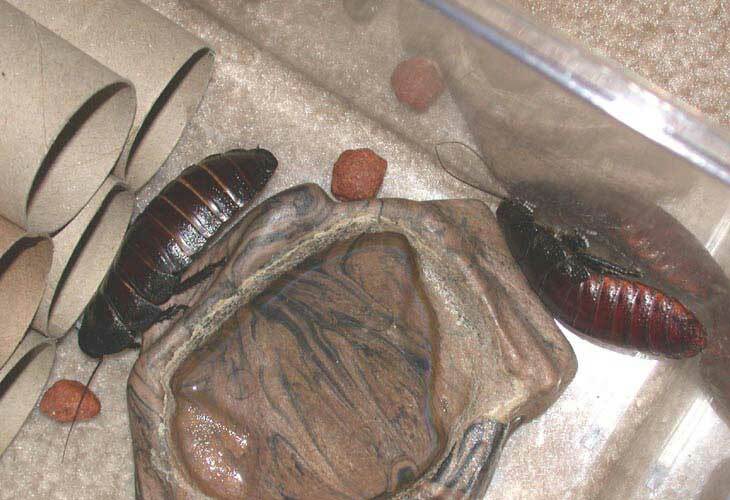 Madagascar Hissing Cockroaches. Yes, I really have some. Well, it's only one now because one of them died earlier this year. My mother commented that I should kill the remaining one to accompany the first into the afterlife and my brother's fiancee cheered. I got them from a friend who does Integrated Pest Management and likes all manner of insecty/arachnidy things. They were both female and I named them both Bob because they both looked the same. They don't have wings, so they don't fly. I feed them dry dog food and water in the dish shown in the pictures. They have a little sort of pyramid of toilet paper tubes as a hiding area. Instead of hiding inside of them, they like to sit underneath the whole assemblage, don't ask me why as I have no idea. 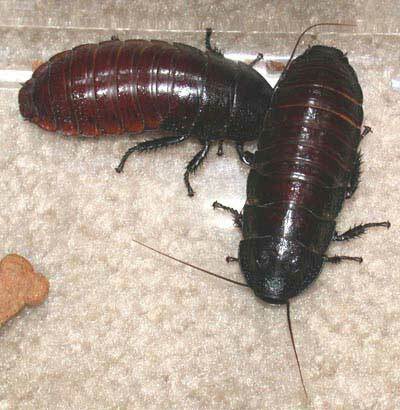 They don't move very fast and are large - a little over two inches long. They disgust and fascinate me, so I don't touch them very often. They'll hiss if you bother them and sometimes I hear them hiss in the middle of the night. Mostly they're silent, except for hearing tiny rolling noises as they try to eat the pieces of dogfood by nibbling on them, but due to having no arms they also push it across the tank floor. I call it roach bowling. These are the same kinds of roaches you'll sometime find used in cockroach races where roaches with numbers painted on their backs are put into the middle of a circle and the winner is the one to reach the outside first. As for the question of how do I know they are girls... Boys look slightly different than girls because they have this bumpy looking section of carapace on their backs behind the head area. This doesn't show up until after they've grown up a bit though. 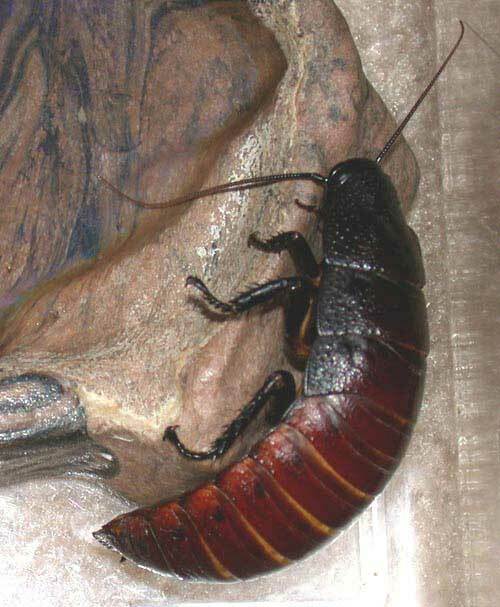 If I had a boy roach, yes, I would probably have a lot of little baby roaches. I'm not going to go there though! If you click on the photos, you can see larger versions. They're not the most exciting pets in terms of being cuddly/touchable or movement. My remaining Bob has been alive for I think over 3 years. That's a pretty long time for a bug. 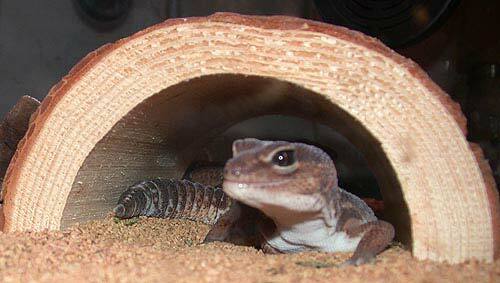 The two African Fat-tailed Geckos are refugees from a friend who didn't want to take care of them anymore. In my usual hugely creative pet & stuffed animal naming scheme, I named them One and Two. One must have previously lost its tail because it has a knobby looking one which is a replacement grown after such incidents. Two has the "first" original tail that has bumpy ridges and a pointy end. 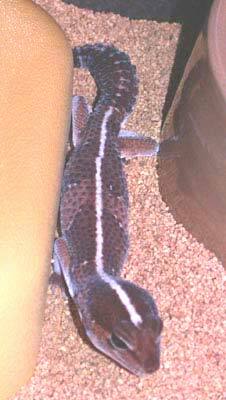 Two also has a white back stripe. They live in a nice big tank with various heating elements, two hidey hole thingees, a water dish, and some various sticks. Supposedly one is a girl and one is a boy, but I don't feel like I want to bother them enough to find out which is which. It just seems rude. They eat crickets. However, they are really slow creatures and I've seen them miss in pouncing because by the time they slowly recognize a moving object as food (bad eyesight or slow minds, I'm not sure which) it may have already moved out of the way. Their desire to eat varies from once every other day to once every couple of days. I've also watched them pounce on the other's arm or leg as if it were a cricket, the pouncer looking mildly surprised that it's not a cricket and the pouncee looking annoyed. So basically the routine is that I dump in a bag of crickets (12-15) and eventually they figure out something is going on outside of the hidey hole and they come out. They spend a few seconds walking around and then encounter crickets. When they see the crickets they stop and look at it for a second or two or three or more. After a bit it registers as potential food and they shake their tails like little nonrattling rattlesnaked before the final pounce. When they miss they get a mouthfull of the bark I use as a substrate and look surprised as they spit it out. They're quite cute with shiny little eyes (click on the pics for bigger versions) and are not the tropical gecko type with the weird sticky fingers. They also have eyelids and do not do that disturbing lick-your-eyeballs-to-keep-them-moist thing. These guys also tend to stay still most of the time and like to hide in their plastic yellow house or under the hollowed out half log piece. They occasionally shed, but usually eat it (something about nutrients). Strangely enough they "do their business" only in one corner of the tank, inhernet neat freaks or something. It makes me wonder if I could train them to use a litter box and let them loose in the apartment. 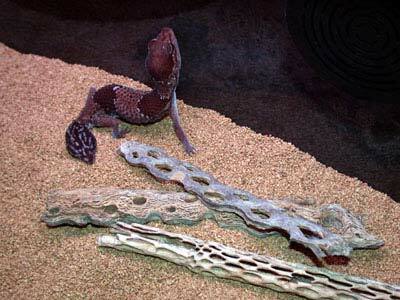 The Gex - Various information including pictures of tiny baby ones. I have a 15 gallon tall tank (bottom is the same size as a 10 gallon, but it's taller) in which I keep guppies and a couple of other types of fish including Rasbora heteromorphas, an upsidown catfish, and this flat catfish that I forget what it's called. 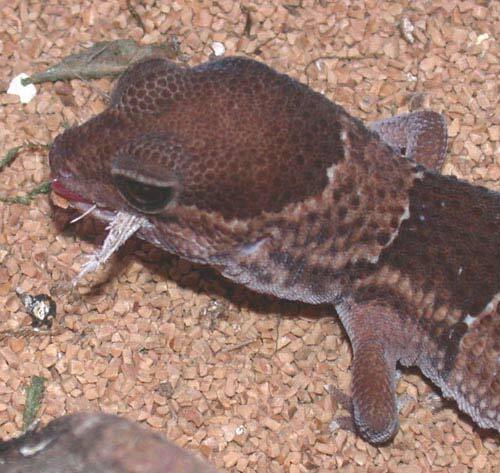 The flat catfish doesn't like to move very much, in fact it likes to bury itself in the sand and stay very still. Some friends of mine once took care of the fish for me over a weekend when I was gone. When I got home there were a few phone messages and emails from them because they worried that they'd killed the flat catfish. I stopped laughing long enough to tell them no, it just basically acts as if it were dead most of the time. The Rasboras actually exhibit some schooling behaviour which is fun to watch in comparison to the other fish which are just scattered about. The guppies are various fancy guppies that I let breed. It's a Darwinian tank for the most part and I hope to one day breed the ueberguppy that will take over the world. I name everything Elvis, with the exception of two differen male guppies who for various reasons were named Lex Luther (after the villain and the 99 Theses guy) and Jack the Ripper. Jack was my favorite, but alas, he succumbed to some disease or another and is no more. Rest in peace, Jack.